Some people think there are no lines or borders with God!!! A misguided and unfocused artificial intelligence film that’s visually very pretty. I'm almost surprised at others' unpleasant reactions to this because I believed all of my distaste to stem directly from my dislike of Die Antwoord. I almost want to watch again to see what else is weak. there are nice tidbits and some cool action sequences, but the main story is undercooked and basically relies on raising "aww"s from the audience. it's somewhat of a rehash of district 9 in that matter. tthe problem is that he main story is not as tightly consctructed as district 9, and everything gets rushed towards the end. 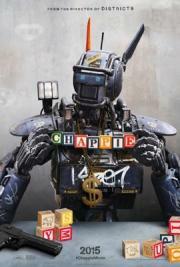 on a side note, the voice of chappie was way over the top. too much fluff, very little stuff in this one. The script of this film could have used a rewrite. Most of the characters in this movie are unlikable. The actors do a goo job here but they would have benefited with a better script. Overall this film is disappointing.